Train to perform DOT physical examinations for Commercial Motor Vehicle drivers. Qualify to sit for the national exam - 99% Exam Pass Rate. Why only $199? What Do Participants Say? We are frequently asked why our NRCME training program is so much less expensive than other programs, certainly other ones that consist of video presentations. EMedHome launched in February of 2000 with the premise that quality CME does not have to be expensive. We are practicing Emergency Physicians and are dedicated to producing quality, yet inexpensive, continuing medical education content. Our NRCME training program is fully accredited and covers everything you need to know to pass the NRCME exam and to properly evaluate commercial drivers in your practice. So many Features. Benefits. Reasons to Start Now. Here's a bit of what you get for only $199. All of this is yours with unlimited access for one year, and you can earn up to 9 AMA PRA Category 1 Credits™. This training program meets the core curriculum requirements established by the Federal Motor Carrier Safety Administration. Includes a Workbook/Syllabus for in-depth review and preparation! Complete the course and get fully trained and prepared. Watch the presentations with any device at any time - in the comfort of your home or office, on your schedule. Start and stop as often as you like! Immediately print your certificate of completion that qualifies you to sit for the Federal Registry examination. Our Video Presentations cover all the material you need to become a certified DOT medical examiner and pass the NRCME Exam. You do not need to be connected to the internet to watch the video modules after you have downloaded them. Take the course with you anywhere! Over 285 practice questions included. Our course includes samples of all of the forms you will use as a certified medical examiner. The EMedHome.com National Registry of Certified Medical Examiners (NRCME) training program educates medical providers to perform medical fitness for duty examinations for Commercial Motor Vehicle drivers and qualify to sit for the national exam. We train you to perform medical fitness for duty examinations for Commercial Motor Vehicle drivers. Upon completion, you'll be awarded a Certificate of Completion, allowing you to sit for the national exam. 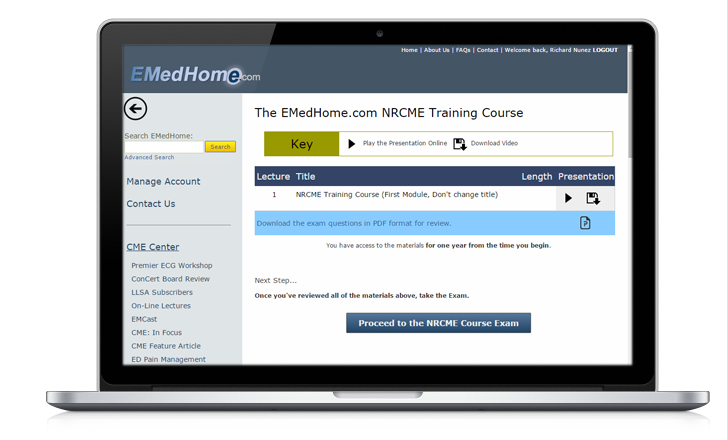 EMedHome.com is an Accredited Training Organization for the NRCME. Top quality medical education and training at very reasonable prices. Must be connected to the internet to view? Watch on mobile phones and tablets? Get certificate of completion immediately online?